FTC Disclosure: I received a copy of this CD in exchange for review. No money changed hands and all opinions presented here are my own. Every so often I get the opportunity to review releases by smaller, independent or lesser known artists. This is something I’d love to do a lot more of on this blog, moving forward. 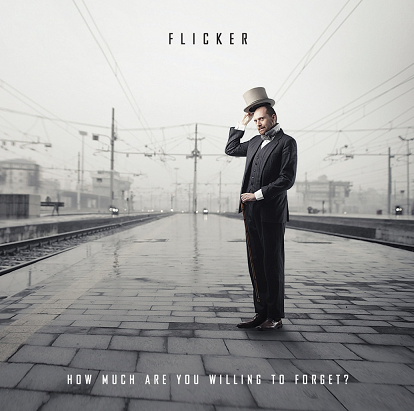 To that end I was contacted early this year by the band Flicker, who wanted me to review their new album, How Much Are You Willing to Forget? In the meantime I read and reviewed Scott Bishop’s A Soul’s Calling first. Not because I hadn’t listened to this…but because I was finding it genuinely difficult to stop listening to this long enough to write about it. Doing reviews of unknowns on this blog led me to fear that I’d be flooding my reading and listening time with…well, stuff I’d rather not flood that time with. Here, however, Flicker has fenced me into the opposite problem: enjoying something to the point that writing about it feels intimidating. Nevertheless, I shall attempt it. There’s a definite Pink Floyd vibe to this collection of 9 songs, but I feel as though carrying the comparison too far does this band a disservice. After all, part of the enduring appeal of Pink Floyd has to do with their overt challenging of musical preconceptions. (The same can of course be said of Frank Zappa.) It gives them a pretty timeless shelf-life, but it also means that it’s easy to find examples of that approach backfiring, where they overreach just enough that the weirdness and experimentalism starts to feel silly and reductive. When it comes naturally the listener feels as though he’s being granted access to an entirely new and exciting universe, bursting with possibility. When it doesn’t come naturally it feels completely artificial, and somehow even embarrassing. Here the experimentalism comes naturally, and the stranger passages — of which there are many — feel like integral parts of the journey. This is a good thing, because the songs are relatively long (five of the nine songs break the six-minute mark, and one falls just short) and if the experiment doesn’t pay off, you’re stuck with it for the long haul. Fortunately, the experiments pay off, and there’s not a disappointing moment on the disc. Flicker shifts from brash to spacey to heartfelt in the space of a single chord change and it feels right. In fact, for an album of only fifty minutes or so, it sure covers a lot of ground. What it does lack, I would say, is a stronger sense of cohesion…a symptom of its own ambitiousness. It feels as though the band is more interested in crafting a series of strong singular experiences than one grander, album-spanning one. Not a problem in itself, of course, but it does make How Much Are You Willing to Forget? feel more like a collection of impressive splinters than like one single work of art. It’s a small criticism at best, and honestly not much of one at all, especially when the individual tracks are this good. My personal pick for standout track is “Counting Time,” a cathartic series of smaller build-ups and releases that swirl about in an atmosphere of uneasiness. It’s a rare song that uses well-chosen moments of silence to make itself feel massive and eternal, and it’s easily the one I’ve returned to most. There’s also a brilliant, improvised-sounding vocal outtro by an uncredited female that adds a lot of personality to an already excellent tune. As far as accessibility goes, both “Go” and “Everywhere Face” sound tailor-made for the radio…and, not coincidentally I’m sure, are recorded to radio-friendly lengths. The former is an absolutely Floyd-inspired ramp-up promising big things that the album fortunately delivers, and the latter is a much darker, pounding dirge that nevertheless carries the sense of immediate familiarity every single needs. Some great and rewarding experimentation rounds out the experience in other tracks, such as “My Empty Head” which fills more than half of its space with a lengthy, airy jam that works brilliantly here and promises so much more if the band is willing to play around with it in concert. It’s passages like this that tend to resonate with me most, and in the case of Flicker it’s the moment that absolutely had me hooked. It takes more than talent to record a piece of music like this…it takes heart. And judging by this track alone, Flicker has a lot of both. “Is This Real Life?” closes the album with a long, plaintive piano-driven ebb into nothingness, and it’s exactly the kind of gorgeous simplicity that only a band with this much confidence in itself can pull off well. It’s an excellent way to punctuate a debut, bringing both closure to the listening experience and leaving a lot of room to anticipate an impressive followup. It’s also a welcome breath of simple reassurance after an album’s worth of restless complexity, and a great way to bring the experience back down to earth. It’s always nice to discover a new band, especially one so versatile and restlessly impressive. I look forward to hearing a lot more from them, so be sure to check them out on iTunes or at their Bandcamp page. And no rush on the follow-up, guys…I’ll have this one in rotation for a long time.